CSR stands for Corporate Social Responsibility, sometimes referred to as a sustainability strategy, and is a broad term used to describe a business’s efforts to make a difference and improve society in some way. These efforts could be anything from donating money to causes or charities to putting into practice environmentally friendly policies in the workplace. So why is CSR so great for your business? It gives your company a good reputation and can often get very positive press attention for your company to take part in community based activities. If the charitable events encourage involvement of local people it can be great for getting your name out there, therefore developing your brands awareness. In a Global CSR Study consumers have stated that they have 93% more of a positive image and are 90% more likely to trust a company that supports social and environmental issues. CSR helps a company retain staff. Employees getting involved in social and charitable activities can often feel more motivated and loyal, ultimately reducing the cost and disruption of hiring. CSR has the ability to highly motivate staff this resulting in better productivity for the businesses success and progression. 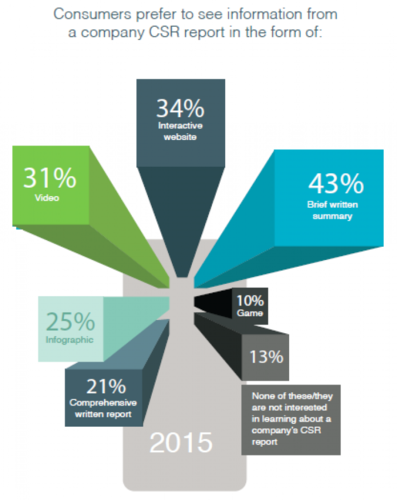 Research shows consumers are basing their buying decisions on CSR. A study earlier this year by Cone Communications and Echo Research revealed 90% of shoppers are likely to switch to brands that support a good cause, given similar price and quality. Good CSR activities can create relationships with local authorities and businesses, making doing business easier and giving the potential opportunities for developing business deals. Understanding the wider impact your business has on the environment and community can give your business the opportunity to develop new products and services. It is evident when looking into CSR this is not something that just benefits bigger businesses but that it is a strategy that all companies should adapt into how they are run and should not be seen as something that feels obligatory. CSR can dramatically improve a business’s progression at little cost. Using CSR for business evidently has the potential to help an organisation develop at a progressive rate. Some consumers are sceptical about the way, in which they are presented with CSR reports, it is important that organisations utilise the diverse channels and platforms that have been made accessible through advances in technology. Using interactive websites and social media channels can open up lines of communication and help connect a business to specific target audiences. These mediums essentially give organisations their own voice, allowing them to show consumers how they are using the CSR strategy in a trustworthy way by adding this personal and interactive touch. Do you feel after reading this that implementing CSR into your business would be beneficial; let us know in the comments below.